The NutriChef PKFD14BK food Dehydrator comes with five stackable trays and you may use as many as you need. You may dehydrate one fruit or a basketful as per your requirement. What’s more! The trays come with slots allowing you the flexibility of drying an assortment of foods in a single tray. The system is easy to use as it involves only one button operation. The temperature goes as high as 180° F. Additionally, there is easy maintenance involved in cleaning the NutriChef Food Dehydrator. The trays are removable and the machine itself is also equally convenient to clean. Let’s take a thorough look at the features of the NutriChef Food Dehydrator to help you make a better decision in your purchasing options. The NutriChef Food Dehydrator uses a heat element located at the bottom of the machine and fan system to dry the food systematically. The flow of heat travels evenly in each tray. The food dries up and shrinks as the moisture is removed. Due to the systematic drying process the moisture is thoroughly removed from the food items extending the shelf life to a year or sometimes even two. The NutriChef Food Dehydrator heats the food at controlled and consistent temperature, thereby retaining 97% of the nutrients in the food. The food dried in NutriChef Food Dehydrator is a better choice than any shelved product in the market as those foods are cooked at high temperatures and lose the nutrients and food value. The food dried in NutriChef Food Dehydrator is the best way of preserving food as it uses no additives or harmful preservatives. Any canned food item bought in the market uses preservatives and coloring. Also many a times the canned food has invisible bacteria that silently does harm. In case of dried up food, the mold shows up preventing in ingestion of bad food. Since you are drying up and preserving raw food the cost of food is at its minimum possible. You can enjoy off-season food produce at minimal cost. It also helps to save costs for large families and people with large appetites. The dried food may also be taken along when travelling or camping. The NutriChef Food Dehydrator comes with five adjustable trays. It is easy to use as all that you have to do is load the food and stack the trays. If you are drying smaller portion of food, you may stack fewer trays instead of all five. The NutriChef Food Dehydrator takes lesser drying time than using the natural methods. The number of days is significantly reduced to a few hours allowing you to stack up the healthy food in your store. NutriChef Food Dehydrator comes with one on and off switch button making it easy to operate. All that you have to do is click the button. The temperature is controlled automatically and goes up as high as 180 degrees max. 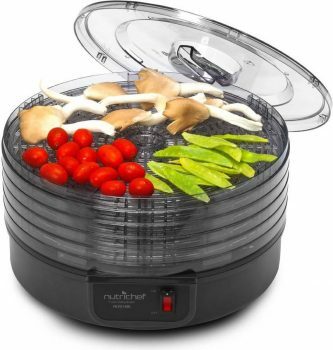 The NutriChef Food Dehydrator is light weight machine weighing only 6.6 pounds. Also, it is small in size and you can easily fit it on your kitchen counter or store it up in a cabinet. It can easily be carried along, if you are using the product for commercial purposes or travelling. This product has some optional but valuable accessories which may be required later. Most people buy Fruit Roll Sheets and Clean-A-Screen Trays along with their NutriChef Food Dehydrator to enhance their drying experience. The NutriChef Food Dehydrator is a reliable and efficient machine and produces good results every single time. The mechanism is built to be consistent in its outcome delivering perfectly moisture-free produce. The NutriChef Food Dehydrator is a flexible product. You can add or reduce the number of trays or dry up a whole range of produce. You can dry up delicate tomatoes to meat products as jerky or cook up fruit leather or make potato and kale chips. The NutriChef Food Dehydrator takes up very little space. Even if you have a kitchen that is very small in size and loads to dry, not to worry! Your NutriChef Food Dehydrator will fit in and easily be stacked away. You can just stack your veggies or meat to be dried and get about other chores while the NutriChef Food Dehydrator takes care of your drying needs. Each tray receives the heat evenly, so you have nothing extra to worry about. The machine is expandable and can dry a large amount of food at a go. You needn’t wait to dry up the food in separate batches. The complete list of NutriChef Food Dehydrator specification is discussed in detail. The product comes in black exterior color. The dimensions of NutriChef Food Dehydrator is 11 x 7 x 12.2 inches. It is perfect for limited kitchen space. The item weighs 6.6 pounds and is easily portable. The NutriChef Food Dehydrator is made of plastic and is very durable. Warranty is available for a year. The NutriChef Food Dehydrator uses high heat that dries up and shrinks the food by removing the moisture content. The device retains 97% of nutrients. The temperature is controlled by the machine and can go up as high as 180 degrees max. The NutriChef Food Dehydrator uses the heat flow from the element located at the bottom along with airflow from the fan. They together keep the food dry and the air smell free. The heat moves up evenly through the trays. The device comes with 5 trays which are removable as per your requirements. The machine comes with a single on/off switch and makes operation easy even for beginners. The benefits of the NutriChef Food Dehydrator are discussed below. The removable and stain resistant trays are easy to clean. You may even wash the trays in the dishwasher. Optional accessories as roll-up sheets and Clean-a-Screens cleaning is a bliss. The device helps to turn out the desired dried food while maintaining 97% of the nutrients. The NutriChef Food Dehydrator allows you to dry up the food rather quickly due to its evenly-distributed high heat flow and airflow system. In matter of hours your seeds, fruits and Beef Jerky are ready for storage. The gadget takes very little of the kitchen space. Also since the trays are vertically stacked, they require no additional space. The device is perfect for small kitchens. The device due to its heat flow and airflow keeps the smell away. There is no mixing of smells or flavors. But as far as the pungent smelling items go, as onions, ginger and garlic it is better to dry them separately. The NutriChef Food Dehydrator allows healthy and nutritious food as the output of the drying process retaining 97% nutrients. This is by far the much preferred choice than the marketed varieties packed with chemicals and reduction of nutrients as they are dried at high temperatures. The system takes care of the drying process after being switched on. You don’t have to worry about anything once the trays have been stacked. The machine will take care of it. You can stack up as many as 5 trays with different food items in each tray. The device is made of durable plastic and ensures long serving capacity. The NutriChef Food Dehydrator has very few demerits. However it is good be aware to better judge your suitability. The device does not come with a timer. Since it allows a variety of food to be stacked at the same time, perhaps the need for one may not be required. The device does not come with a thermostat. The device adjusts the temperature and does not let it exceed 180 degrees F.
Q: Is It Important to Watch the Weather While Drying the Food in NutriChef Food Dehydrator? The weather does not interfere with the drying process. However, while cooling, if the weather is highly humid, the dried food will get moisture in it and the drying effort will go futile. Q: Do I Need a Lot of Space for the NutriChef Food Dehydrator? No. It is very small in size and all the trays are stackable so you can wash by hand or in the diswasher, dry and stack them back in the machine. The machine is also easy to wash.
Q: If I Dry an Assortment of Food, Will the Flavors or Smells Mixup? No the flavors or smells will not mix up. NutriChef Food Dehydrator is built to air out the smell from each tray. However, if you are drying pungent smelling organic food, then please do not dry them with delicate items. Avoid, garlic, onions etc. Q: Should I Unstack Trays While Drying Food Items If I Have Only a Few Items to Dry? Yes. When you are not using the additional trays, simply remove them. Q: If I Have Drippy Food Items and Dry Food Items, Should I Stack Them in Different Trays? Yes. You can keep the drippy items at the bottom and place the drier items on the top. The NutriChef PKFD14BK Food Dehydrator machine is an easy to use machine and well-liked by both beginners and experienced users. It is a hassle-free device. Not only is it operational by a single switch-on switch-off button, but equally easy to clean and maintain. You simple have to unstack the layers and wash by hand or the dishwasher, dry and stack them back in the machine. It is highly efficient and retains 97% nutrition in the food. The NutriChef PKFD14BK Food Dehydrator is versatile and can dry delicate and tougher items ranging from tomatoes, fruits, seeds to beef jerky. It helps you to dry an assortment of food items in the same attempt while maintaining their flavor. What’s more! The NutriChef PKFD14BK Food Dehydrator takes little space for storage. It is a reliable, durable and an efficient machine. It is better than other dehydrators in the market and preferred by both beginners and seasoned users. It gives better result than some other high featured and more expensive dehydrators as its heating and drying mechanism is highly efficient. It makes a great gift item for the close ones and good associates.